It may seem premature to address the waiver wire when drafts just finished, but bear with me. I always tend to have some post-draft regret when it comes to one or two guys on my roster. Take a look at the waiver wire and you will probably see a couple of guys that you would rather have on your team than the guys at the end of your bench. So here we go, your first look at the players you should have drafted. Keep in mind that this is a pickup for the short term. Leveon Bell owns this job and will not be giving it up anytime soon. However, Bell won't be playing in the first two games. Williams has shown himself to be a competent starter in the past and can likely net you RB2 numbers at a waiver wire price. Get familiar with Dion Lewis, he can help your fantasy team. I know, the Seahawks aren't exactly bombing it out against opponents. Imagine this though, Lockett looks to have all of the skills of Percy Harvin but a good attitude. Even if he does not see the volume of targets that fantasy owners like, he could work his way up to production reminiscent of Desean Jackson over time. I have written about Marvin Jones already, but I see him going undrafted in a lot of leagues. This guy has the talent to make big things happen when he is on the field. Defenders heads will be on a swivel dealing with A.J. Green and Jeremy Hill, so there will be some open real estate. This is a solid guy to have coming off your bench. I've been banging on the Redskins this offseason and I still think they are a dumpster fire. However, there will still be fantasy points to be collected. Reed is a solid player who has been a victim of injuries. He is out there in a lot of leagues and if he can stay healthy, he could produce like a TE1. Running quarterbacks matter in fantasy football, even if they aren't playing well in the NFL. Tim Tebow is one of the best examples of this. He put up solid fantasy numbers in Denver even though he throws a football about as well as I do. Mariota looks light years better than Tebow and at some points in 2015 I think that Mariota will put up starter-worthy numbers. In a deep league, he at least needs to be owned. Just for the record, I don't expect this to pan out. But if it does, it will probably be the biggest waiver pickup of the season. Michael has as much raw ability as any running back in the NFL, but he was a third stringer and basically given away by the Seahawks. This is because he is reportedly a head case and does not maintain focus. I think that if he gets a chance to start in Dallas he will be a fantasy monster, but the odds are slim. If you have bench space, you need to grab this guy just in case. I like T.J. Yeldon and he is obviously the back to own in Jacksonville. Don't forget about last season though. Denard Robinson definitely has playmaking ability and will be flex-worthy at times. In the event of an injury, Robinson would shoot up to a top 20 or 30 back. I think that he is worth rostering on most teams. There is a lot of young potential on the Tennessee offense. Green-Beckham may well not pan out for a year or two, but I would hate to miss out if things click early. He has the speed and athleticism to get free and the size to be a force in the red zone. If he can get on the same page as Mariota quickly, it will be scary for opposing defenses. Marlon Brown was MIA last season, but he still has plenty of potential. This one is a deep pull, but I like Brown's prospects for a resurgence. He is a third year wide receiver and the competition for playing time is thinning out. 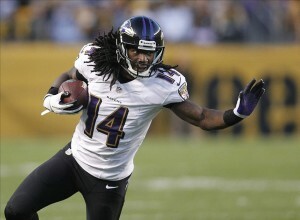 Breshad Perriman is out with an injury and Kamar Aiken is not the most impressive receiver. Steve Smith cannot catch every pass and Brown was a red zone presence two years ago as a rookie. I think that if things fall correctly, Brown could find himself starting opposite Smith and fantasy goodness will ensue. Aaron Rodgers has not looked at the tight end much for the last couple of seasons, but I think that could change in 2015. The absence of Jordy Nelson is going to change things in Green Bay and I'm not sold on the receiving corps as a whole. I would obviously take Randall Cobb all day, but I'll pass on paying for Davante Adams when I can grab Richard Rodgers for free with a similar chance at success. Quick has tremendous upside and has succeeded in small doses. He should start the year as the top receiver for the Rams and Nick Foles has the ability to get him the ball. If Quick can stay healthy, he'll be a fantasy starter in 2015.